How to color white with Copics: Fuzzy bear! Happy Memorial Day! 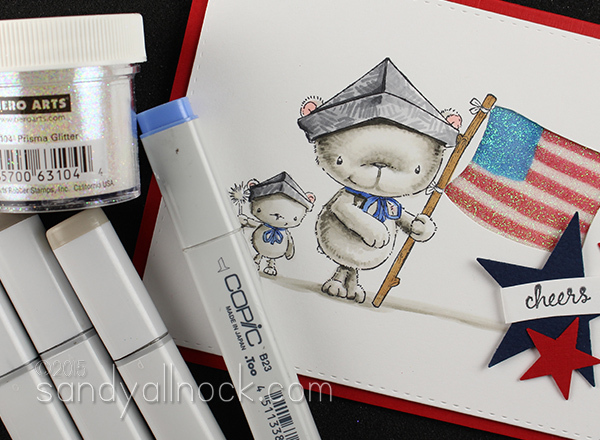 I have a double blessing to share today….not only showing how to color white with Copics on a sweet patriotic card for the holiday, but a new release from Purple Onion Designs, drawn by the awesome Stacey Yacula! The image is called Bursting with Pride – how perfect, right? I’ll have more cards shared over on Purple Onion Designs, and be sure to check in to leave comments to qualify to win. The entire release has some special discounted pricing as well so…yeah, you know what to do! When I saw this stamp I just had to color it ASAP. So darling! Just look at those happy little bears! In the video today, you’ll learn about how to color white with Copics as you see the progressive difference made by darker and darker colors. Though I know that can scare some, it’s worth the effort if you can be brave and give it a try! Watch the video below, or click HERE to watch in HD on YouTube! This same technique with progressively darker colors is something you can try with any colored bear, too! My little glitter technique is just one of many you can find for sealing in glitter. I do this not only for OWH cards – but even beyond that. I remember once I put glitter on a card for my Mom, and when we discussed glitter once, she specifically mentioned that card….and I realized one of my creations made a mess for her! So though the shimmer is awesome, sealing it in to keep the mess to a minimum is also a big bonus! Below are links to the supplies I’ve used for today’s project; click on the picture or wording to get taken directly to the item. Affiliate links may used, which means if you make a purchase I receive a small commission at no extra cost to you. I truly appreciate your support towards the costs of running this blog. Read more. I hope you’ll try getting a little bold and practicing my crazy technique for how to color white with Copics… even if you don’t go as dark as I did, a little contrast can really help your images! Oh my goodness Sandy. I love this card. And what a great way to seal in the glitter. I have to try that. Thanks for the inspiration. This is adorable!!! I love this image!! 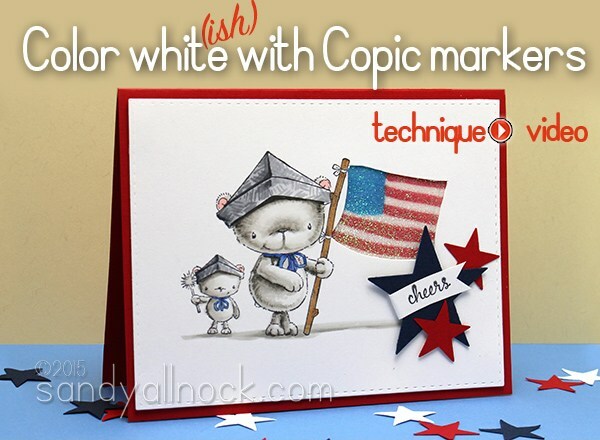 Great way to achieve white on a card when you color. Love it. And it is amazing what you did with the glitter. I was surprised but it works..thanks for sharing your ideas. A cute cute card. Great job!! genius sealing of the glitter!! I will use that!! This is a very cute card!!! Do you ever rest ??? Happy Memorial Day to you and thank you for all the things you have done for our troops. A very nice job Sandy. Love the way you sealed in the glitter! Thanks for the lesson on coloring white. I really need help with that for coloring cat and dog stamps as well as dogwood flowers. Thank you for this instruction! Whites are the hardest for me! Such a cute card! Love the PO new designs… Thanks for the tip of getting the glitter better attached, and even contained. Thanks for another great video Sandy! You should be happy to know that every time I color something with my Copics I ask myself, “Is there enough contrast?” Then I try to be brave and reach for a darker marker!